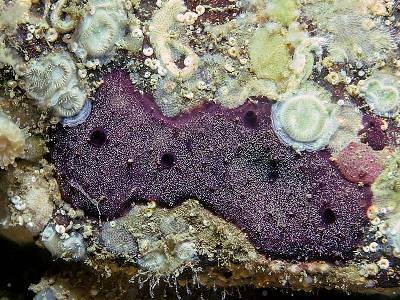 Description: Chelonaplysilla noevus (Carter, 1876) is a dark purple encrusting species with a very characteristic surface reticulation of sand grains visible to the naked eye or with a low magnification. There are coarse sharp conules, similar to those of Aplysilla . 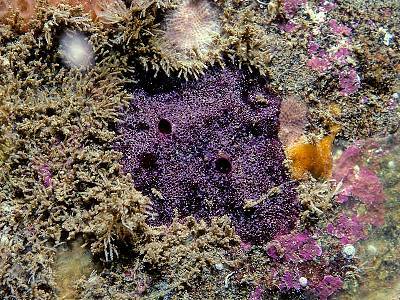 Habitat: On steep or overhanging bedrock faces on the open sea coast, occurring at depths of 15-115 m.
Ecology: In the Mediterranean, violet-black larvae, with a posterior crown of long flagellae, were reported from a specimen collected on October 7. Distribution: A southern species reaching its northern limits on the coast of Northern Ireland at Rathlin Island. Picton, B.E. & Morrow, C.C. (2016). Chelonaplysilla noevus (Carter, 1876). [In] Encyclopedia of Marine Life of Britain and Ireland.